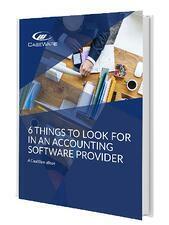 Accounting Software Provider - what to look for? Having the right accounting software solution in place can deliver incredible benefits for your business. But when it comes to selecting the right option there are many factors to bear in mind. In our guide we have compiled six key considerations you should take into account to ensure you make the right decision.